The Spécialités TA Carmina crank uses interchangeable spiders. The arms are available in silver in all sizes 155mm through 180mm, and black in 170mm and 172.5mm. 185mm Carmina cranks are available by special order. Spiders are available in silver and/or black. Chainrings are available in silver or black, depending on type and size. The spider is available in 14 versions, with different bolt circles; double or triple. If you will be using a single chainring, just use one of the double spiders. The Carmina has a beautiful glossy finish, and it's anodized. We stock 155mm, 160mm, 162.5mm, 165mm, 167.5mm, 170mm, 172.5mm, 175mm, 177.5mm and 180mm in the Silver finish, 170mm and 172.5mm in Black. 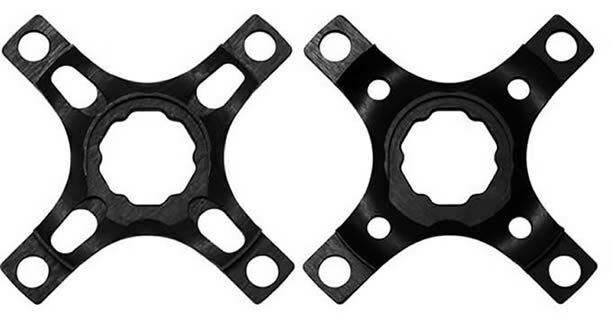 Using the same crank arms, you can change from a 130mm bolt circle to a 110mm or a 104mm or a 94mm bolt circle. I think the real advantage is that shops don't have to stock as many styles of cranks. Just stock the Carmina in several crank lenghs, and several spiders. The spiders attach in the same way that Shimano XTR spiders attach, and require the same Shimano tool. When you order a crankset from me, I will of course install the spider, unless you ask that I not. TA cranks have ISO tapers for the bottom bracket axle. Cranks L&R are sold complete with auto-extrators, pedal washers, and the lockring for the spider. Individual cranks do not include auto-extrators, pedal washers or the spider lockring. Individual left cranks do not include auto-extrator, pedal washer. 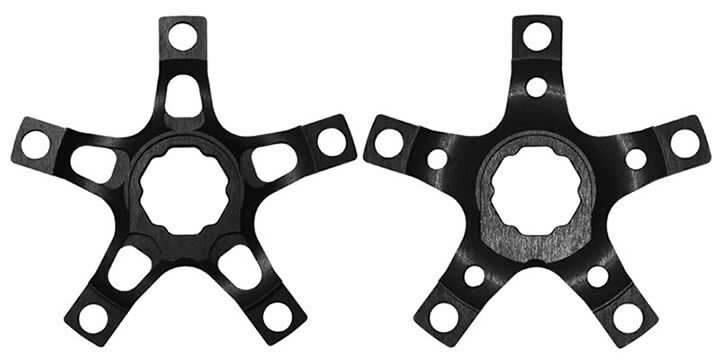 Carmina spiders attach in the same way that Shimano XTR spiders attach, and require the same Shimano tool to tighten the lockring. When you order a crankset from me, I will of course install the spider, unless you ask that I not. While these are all pictured in black, most models are also available in a silver finish matching the cranks. TA cranksets are only sold à la carte. For a complete crankset you choose the crank arm length, then the spider, then the chainrings, and then the chainring bolts. 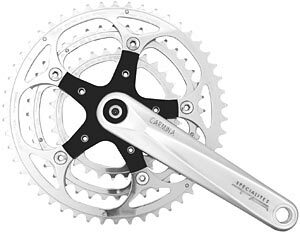 If you purchase a complete Carmina crankset, that's cranks, spider, with TA chainrings and chainring bolts, you'll receive a 10% discount on the total price of those items. See the TA Chainrings page for TA rings to fit the Carmina cranks. To see my full selection of chainrings, click here. For TA Alize cranksets, click here. For more about bottom brackets, click here.